What Is a Plantar Plate Tear? Here at Austin Foot and Ankle Specialists, we provide comprehensive foot care for our patients. Many come in with commonly-known conditions like bunions, plantar fasciitis, and ingrown toenails, but we also treat conditions that are not as widely-recognized, like plantar plate tears. Actually, some patients think they have developed a neuroma, because of the similar symptoms. We are able to provide an accurate diagnosis for our patients and then we create an effective treatment plan so you do not have to live with discomfort or pain from conditions like this. On the bottom of the four lesser toe joints there is a ligament (the plantar plate) between the base of the toe and the metatarsal behind the joint. The plantar plate is responsible for keeping the toe in the metatarsophalangeal joint, especially during the gait cycle when the toes bend at the base of the foot before they push off from the ground. It also brings the toe back to a straight position. Unlike most other ligaments, there is no muscle associated with the plantar plate. In some instances, the ligament tears or becomes overstretched, which causes pain and can lead to toe dislocation. The pain is often misdiagnosed as being a neuroma. This injury is either the result of overuse or from specific damage to the toe and its associated joint. Excessive pressure through the metatarsal bone area, particularly on the metatarsal head that faces the greatest force loads while walking, leads to the plantar plate ligament giving out over time and developing a tear. This often causes pain in the toe’s metatarsophalangeal joint or the ball of foot. In mild cases, there might be no apparent deformity to the toe and a patient may experience either a dull ache or sharp pain. This particular condition tends to involve only one toe at a time, which is often the second toe. As the tear increases over time, the toe will shift up and/or to either side. When the toe is elevated, the associated metatarsal will experience greater pressure on its head from ground forces. This results in pain and bruising. If the ligament tear becomes a chronic condition, there is an increased risk of severe deformity or even the development of hammertoe. As a injury progresses, cartilage in the joint erodes, which can lead to an arthritic condition and greater pain. In early stages of ligament disruption, nonsurgical care can be effective. This entails identifying and eliminating the deforming activity or force. For acute cases, we may need to prescribe a boot or special shoe to keep weight off the front of the foot. We can perform special taping that should remain on the toe for a variable number of weeks. When we do this, we strap the affected toe into a downward position, while also correcting any abnormal sideways drifting. This allows the ligament to heal without facing continued strain. We can provide custom orthotic devices that will support the front of the foot and assist in preventing the deformity from recurring. In the case of chronic and severe deformities, surgical correction is often recommended. 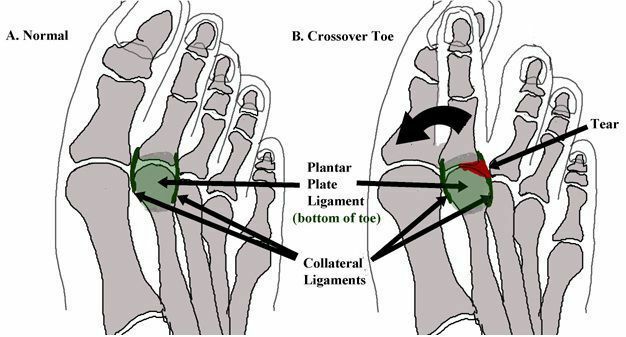 Essentially, the toe needs to be realigned in order to stabilize the joint. The plantar plate can also be repaired and tightened. Plantar plate correction surgery is fairly simple and has little to no downtime for patients. We will use a pin to hold the healing area in place and a boot will need to be worn for about 5-6 weeks. If a patient follows instructions, there can be a full return to favorite activities with little or no pain. Left untreated, a plantar plate tear can lead to a toe that dislocates often and requires a more-involved surgery to fix the problem. Don’t let this happen to you! Instead, come see our leading doctors here at Austin Foot and Ankle Specialists and receive the care you need now. Contact our Austin, TX podiatrist office by calling (512) 328-8900 or schedule an appointment online today.